Andrew Carnegie's vision was to create, at this location, in addition to the world-famous concert hall, a multi-arts complex in which all of the arts could flourish. In 1890, the steel magnate Andrew Carnegie opened what was to be quickly recognized as the greatest concert hall in the world in the new building he had constructed on Manhattan's West Fifty-Seventh Street. Carnegie's "Music Hall" (those words still appear above the main entrance marquee) was seen as the most desirable performance venue in existence (121 years later, this assessment of the Music Hall's prestige is more firmly established than ever.) Complete as this success was, it did not satisfy the great philanthropist. Before the first concert season was over, Andrew Carnegie realized that to make the venture sustainable, additional income would be required. He envisioned an added complex of rental apartments and studios beside, behind and on top of the performance hall. To accomplish this, Carnegie called in one of the foremost architects of the day, Henry J. Hardenburgh, whose accomplishments in New York included the Plaza Hotel, the Dakota Apartments on Central Park West, and the Art Students League building diagonally across Fifty-Seventh Street. 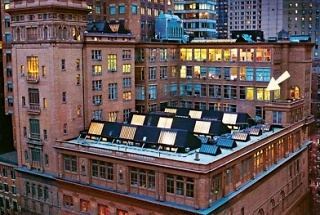 Together, Carnegie and Hardenburgh fashioned a unique multi-arts environment in two dramatic towers rising on either side and above the original building. There were around 170 separate spaces in all, varying in size from huge dance and rehearsal studios to high-ceilinged painter's studios (with the best natural north light in New York), to smaller spaces suitable for writers and musicians. The new studio additions opened in 1894, and were an immediate hit with the artistic community. The studios filled up at once with a lively mix of painters, dancers, writers, musicians and actors. 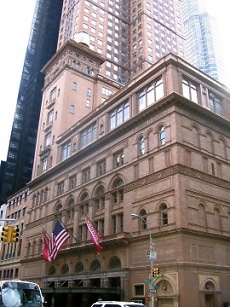 Andrew Carnegie and his architect, Henry Hardenburgh, added two towers of studios, surrounding the original concert hall. These 170 spaces, of varying sizes, included the very best north-light painting studios in New York. My first studio, 1011, is marked with an arrow. Photograph by Joseph Astor. Thus Carnegie Hall took on the character of a richly-textured artistic community which facilitated creative pursuits in all the artsa tradition that survived in a vibrant fashion into the twenty-first century, adding immeasurably to the cultural richness of New York. My own experience with Carnegie Hall began in 1975, when my wife Elizabeth and I leased studio 1011 on the tenth floor of the South Studio Tower. It was a marvelous, high-ceilinged room, with stunning views of Central Park to the north, and the Hudson River to the west. It was the very best painting studio of my entire career. For a portrait artist, it was the very best location in the city. For Elizabeth and me, it was ideal in every way. I was teaching several evenings a week at the Art Students League (across the street, and just up the block). Our home was one-half short block away, in the Alwyn Court Apartments at 58th and Seventh Avenue. Our church was just a few blocks to the east. Our daughter's school was a short bicycle ride to the East Side. 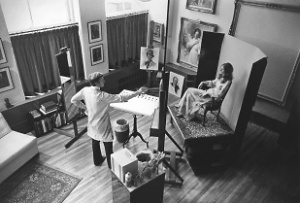 My wife Elizabeth and I (here I am painting her portrait) leased Studio 1011 in the South Tower of Carnegie Hall in 1975. It was a marvelous, high-ceilinged room, with stunning views of Central Park to the north, and the Hudson River to the west. We were entranced by the ambience of the Studios environment. Immediately across the hall was the family home of the well-known New York fashion designer Bert Geiger. Among our other neighbors on the tenth floor were the internationally acclaimed photographer David Hamilton (famed for his volumes of poetic photos of young girls), popular voice coach Silas Engum, and Professor Rudolph Schramm, a radio pioneer, co-founder of the National Symphony Orchestra, and the director of President Franklin Roosevelt's famous radio "fireside chats." It was an incredibly rich creative atmosphere. The other floors were equally packed with diverse artistic talents. A daily treat was encountering New York Times fashion photographer Bill Cunningham coming down in the elevator with his bicycle from his twelfth floor studio. Editta Sherman, photographer of celebrities was midway through her sixty-year reign as the "Duchess of Carnegie Hall." My clients and subjects enjoyed coming to Carnegie Hall. The location was convenient to the great hotels of midtown, and it was an easy address to give to a taxicab driver. Hundreds of sitters came to Studio 10ll, and later Studio 1010, among them evangelist Billy Graham, presidential advisor Clark Clifford, Treasury Secretary Paul O'Neill, Defense Secretary Richard Schlesinger, Mrs. Nelson Rockefeller and publisher Henry Luce. In the Carnegie studio, I painted the leaders of the five greatest banks in America: David Rockefeller of Chase Manhattan, Hugh McColl of Bank of America, Sanford Weill of Citigroup, William Harrison of J.P. Morgan Chase, and John Medlin of Wachovia. 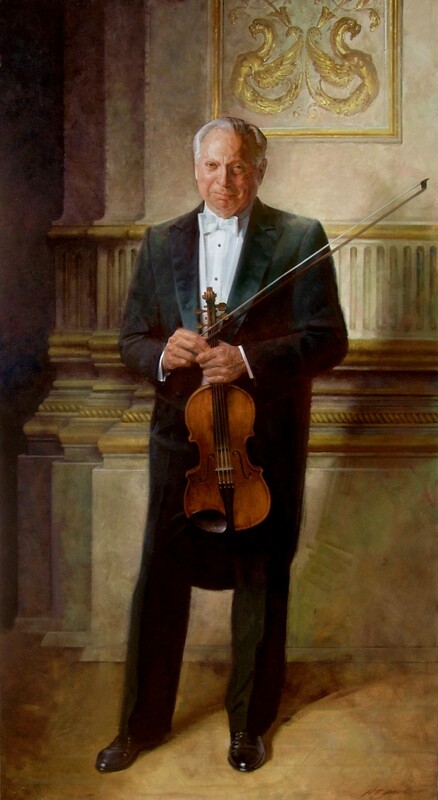 As a token of appreciation to Carnegie Hall for the benefits of working within its walls for more than three decades, I painted this portrait of the man who saved Carnegie Hall from demolition in the 1960's: violinist Isaac Stern. 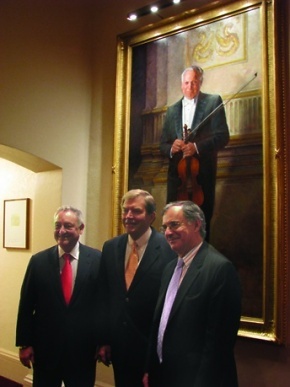 Here I'm posing with the Chairman of Carnegie Hall, Sanford Weill, and the Artistic and Executive Director, Sir Clive Gillinson. Click here to view the complete painting. The loss of our Carnegie Hall studio, in 2008, was painful for me and for my family (my children had never known a time when Carnegie was not the geographical and logistic focus of our life as a family). Since the Carnegie closing, I have held my sittings and meetings with clients in the luxurious accommodations of the New York Athletic Club, just two blocks away on Central Park South (click here to see our new arrangements). We elected to not fight our expulsion from Carnegie Hall, partly out of admiration for the Hall's leaders, Sandy Weill and Clive Gillinson (see the photo at the right), and partly out of gratitude for having been privileged to workfor more than three decades in so glamorous and stimulating an environment. As this is being written, a vast and dramatic renovation of the empty studios is under way, and a breathtaking new environment is being created, dedicated to music education.